Made for use on a grill, this utensil is designed to cook hot dogs or sausages evenly, without grill marks or overly cooking the meat on one or more sides. Typically made from stainless steel, the Hot Dog Roller can cook 1 to 5 hot dogs or sausages at one time, allowing all to be turned in unison as only one is turned. 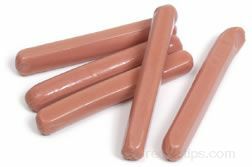 The wieners remain straight, in position between the rollers and cooking evenly around the casing on the meat.